Modi Comes Out of Silent Mode? 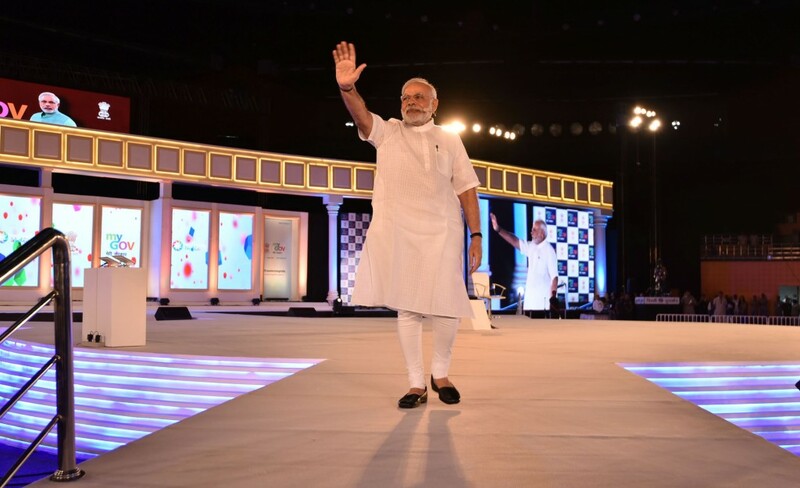 At his first US ‘town hall’ type address on July 6, Narendra Modi was at his theatrical best. Using his trademark 1940-50 era filmy style of delivering dialogues in in stentorian voice with much flailing of hands he told a selected audience at a stadium in Delhi how ‘angry’ he gets when he finds ‘anti-social elements’ going wild in the name of ‘cow protection’. The prime minister has used ‘Maun’ (silence) as his main weapon to blunt criticism by the Opposition parties. So when he suddenly opened his mouth can it be doubted that there must have been an urgent reason: the fallout of the Dalit anger on the polls in his home state, Gujarat, as well the crucial state of UP and also Punjab. The Dalits have vented their ire at him and his party since the suicide of a Dalit research scholar in Hyderabad a year ago and the more recent spate of flogging in Gujarat and physical assaults in many other states which include Haryana, Maharashtra and Jharkhand, all ruled by the BJP. The BJP has ensured that beef becomes a strong emotive issue in the country. It has also become a sort of Hindu versus Muslim issue. For Modi and his party to ask the Opposition parties not to ‘politicise’ the activities of the so-called cow protectors is disingenuous when this issue has virtually replaced the ‘Ram Mandir’ issue as the primary call of the Hindutva forces. It appeared like a dialogue straight from an Indian movie when Modi thundered, ‘Shoot me if you want, but not Dalits.’ This was an emotional cry aimed at the Dalits whose votes he would need in the coming state assembly polls. Note that his emotional outreach was not directed at the Muslims who remain more estranged from the BJP than ever before. Is his love for the people of the country discriminatory? Does he sincerely believe in ‘sab ka vikas’ (development of all communities)? And what is his prescription to end the chain of violence against Dalits by the ‘anti-social elements’? The state governments should prepare a ‘dossier’ of such persons to keep an eye on the activities of what he night call ‘bad cow protectors’. Remember he clarified in that very ‘town hall’ peroration that not every ‘Gau Rakshak’ (cow protector) was bad. It may not be done very professionally and may be done on a small scale but the police in the states do keep a ‘dossier’ on criminals. That does not help much in bringing down the crime rate drastically. It is generally believed that criminals of various hues are deterred by the provision of strict punishment in the law. Modi did not seek or speak of any punishment for the ‘anti-social’ elements—a mere ‘handful’ in his words. He has already implied that the ‘good’ cow protectors need not fear the law. Modi does not willing to see that beef and the cow protection issue is being used to polarise the country on the basis of religion. The spurt in vigilantism in the country has seen people being beaten, threatened and killed on mere suspicion that they had stored or consumed beef. A large number of BJP stalwarts, not to speak of leaders from the rest of the ‘Sangh Parivar’ jump to defend people accused of perpetrating violence on the basis of rumours. In India your dietary preference can lead to some very serious consequences. This is not what you expect to see in a country that aspires to be counted among the top in the world. Modi has woken up to the fact that he and his party will suffer immensely because the so-called ‘ Gau Rakshaks’ (cow protectors) are terrorising the Dalits, the Muslims and just about anyone who is engaged in the business of animal slaughter, skinning dead animals or even the trade of import or export of meat. The fact is that all ‘Gau Rakshaks’ (good or bad) have close links with the Sangh Parivar to which Modi also belongs and have received encouragement from Modispeak, especially during and before the 2014 Lok Sabha poll. After his ‘shoot me first’ speech, reactions from some of the Gau Rakshaks indicate that the violence in the name of cow protection is not going to end. The VHP is reported to have warned Modi that he will have to ‘pay’ for his remarks. One of the prominent Gau Rakshaks in UP said that he will organise a ‘Yagna’ (special prayer) in Meerut so that Modi’s regains his senses. A recurring theme in most speeches by Modi during the Lok Sabha poll campaign was cow protection, criticising the then Congress-led government of ushering in a ‘pink revolution’ which was about cow slaughter. In fact, Modi continued with the cow theme even after becoming the prime minister in May 2014. During the Bihar assembly poll campaign in 2015, posters had appeared urging voters to save cow slaughter by voting BJP. Cow slaughter issue was used to divide the people on religious lines and it continues to be so despite Modi’s flare-up at the town hall meeting. After Modi assumed power cow vigilantism in the country has taken a big leap, aided undoubtedly by the BJP-ruled states to introduce stringent rules in the name of protecting the cow. Among the first major policy decision taken by the chief minister of Haryana, a Modi protégé, was to legislate on cow protection and renaming Gurgaon. As for the miseries of the people brought by the monsoon he has done nothing beyond blaming the previous regime. Modi has alluded to the fact that chewing plastic (bags) takes a heavy toll of the cows in the country. This ‘discovery’ by him has come late because never before had he talked about this hazard. If he is serious, he should bring in a law to totally ban the use of plastic bags in the country. That will be in line what the Supreme Court has suggested.